Delta Air Lines has begun its seasonal nonstop service between Minneapolis-St. Paul and Rome on Wednesday. The Atlanta-based carrier celebrated the latest addition to Minneapolis-St. Paul International Airport’s list of global destinations with preflight water arches and Italian fare. Delta is the dominant carrier at MSP, offering its customers the most long-haul destinations including Amsterdam, London, Paris and Tokyo-Narita. Most Rome flights from the U.S. originate in New York but Delta’s route from Minneapolis may grab some travelers in the Midwest, said William S. Swelbar, a research engineer at MIT’s International Center for Air Transportation. “They see an opportunity to intercept some of the [Midwest feeder] traffic and to become an alternative” to the New York departure points, he said. A Boeing 767 airplane will fly in both directions from June through August. The daily flight departs from MSP around 5:30 p.m. and arrives at Fiumicino — Leonardo da Vinci International Airport about nine hours and 40 minutes later. Return flights leave Rome daily around noon, landing in the Twin Cities nearly 11 hours later around 4 p.m.
Those who plan their vacations n advance can expect to pay roughly $1,200 to $1,700 for a round-trip ticket, according to a search on Delta’s reservation system. Delta last week began new daily, nonstop service to Reykjavik, Iceland, putting it direct competition with Icelandair, which already flies the route. Delta will fly the route only during the summer months. Both airlines fly a Boeing 757 aircraft on the route and depart within a few hours of one another, but Delta significantly undercuts Icelandair on price on many of the days. Icelandair flies the nonstop route year-round, reducing its frequencies during the winter months. Delta’s projected summer traffic numbers will lift MSP to the airline’s No. 2 hub after Atlanta, surpassing Detroit International Airport in terms of passenger volume, company executives said last month. To meet growing demands, Gundersen Health System has announced that beginning June 1 they will add a second MedLink Air helicopter on a six-month trial basis. In addition, from 8 a.m. to 8 p.m. each day, one of the helicopters will be stationed at the Sparta-McCoy Airport and one at the Decorah, Iowa, airport. “Because of our high demand, we aren’t always able to respond when a request for a transport comes in. Adding the second helicopter will allow us to better respond to the needs in our communities,” Stephanie Hill, program director of Gundersen MedLink Air, said. The helicopters will be located at Gundersen in La Crosse from 8 p.m. to 8 a.m. and only one will be in service. Gundersen will be using existing medical flight crew during the trial. A purchase decision will be made near the end of the trial period. Washington could license Irish-based Norwegian Air International to fly to the US within weeks, paving the way for services connecting Cork and Shannon with Boston. Norwegian Air wants to launch a low-cost transatlantic service connecting Europe with North America, using its Irish-registered and regulated subsidiary, but faces opposition from US unions and airlines. Eamonn Brennan, chief executive of the Irish Aviation Authority (IAA), said yesterday that he believed the US department of transportation would grant Norwegian a foreign carrier’s permit within weeks, which would allow the airline to begin planned flights from Cork and Shannon airports to Boston. The department recently announced that it had “tentatively” agreed to give Norwegian its permit, but sought final submissions from interested parties before making a final decision. Claims by US unions and rival airlines that Norwegian is using the Republic as a flag of convenience to hire crew on low wages have delayed a department of transportation decision on the permit by two years. Mr. Brennan pointed out that the US justice department had already said that there was no legal basis for denying Norwegian its permit. He added that the country’s Federal Aviation Administration classes the Republic’s airline safety regime as category one, meaning it meets the highest standards. EU officials will shortly meet with federal government representatives in Washington to press the airline’s case. As Norwegian Air International is registered in the Republic and employs a substantial number of people at its Dublin Airport base, it should be entitled to the permit under EU-US aviation treaties. The IAA has dismissed the flag of convenience claims as untrue in two submissions to the department of transportation. Speaking as the International Air Transport Association opened its annual conference in Dublin, Mr Brennan said that Norwegian’s opponents chiefly feared competition. “This is a new business model; they are trying to bring the Ryanair approach to long-haul,” he said. “They are encountering huge opposition to this change from airlines, supported by labour unions, in the US. The IAA is responsible for regulating Norwegian Air International as it is registered in the Republic. It also oversees Ryanair, one of the world’s biggest airlines, with a fleet of 350 craft. Aer Lingus chief executive, Stephen Kavanagh, also voiced his support for Norwegian’s bid, even though both airlines are set to be rivals if the Scandinavian-owned group gets its US permit. He said that the Irish airline was already the lowest cost operator on the Atlantic, and added that he would question the motives of some of those opposing Norwegian’s permit. The poor thing might have to fly first class. Billy Walters, a professional gambler accused of providing pro golfer Phil Mickelson nonpublic info on publicly traded dairy conglomerate Dean Foods, asked two Manhattan federal judges to grant him unfettered access to his private jet as he awaits trial. Walters, who pleaded not guilty Wednesday to insider trading charges, originally got his ritzy wish — but wound up with some travel restrictions in a separate hearing shortly thereafter. In that hearing, Judge P. Kevin Castel decided that pretrial services, which will supervise Waltes while he’s out on bail, can determine whether to let the mega-millionaire use his own airliner. Castel also limited Walters' travels to parts of New York and California, and required he give authorities notice before traveling to a handful of other states for business. Lawyers for Walters, who's out on a $25 million personal recognizance bond backed by $10 million in cash or property, had argued in favor of private jet access by claiming his businesses require extensive cross-country travel. Prosecutor Brooke E. Cucinella countered Walters — who's worth some $200 million — can easily catch commercial planes, minimizing his flight risk. "He can fly first class," a seemingly exasperated Cucinella told Castel, explaining prosecutors are not asking for burdensome restrictions. In May, Thomas C. Davis, Dean Foods' former chairman, pled guilty to slipping Walters secret intel in exchange for money. Mickelson agreed last month to forfeit $1 million that he allegedly got from one of Walters’ insider tips. ST. PETERSBURG — An Allegiant Air flight that made an emergency landing shortly after takeoff Thursday at St. Pete-Clearwater International Airport is the same plane that made an emergency landing at the same airport less than 24 hours earlier. "Our mechanics and operations team are currently conducting a thorough review and report of the incidents, but we are not able to confirm the root cause at this time," Allegiant said in an email that confirmed that the same plane was involved in both incidents. Allegiant would not say if the aircraft, an Airbus 320 that was manufactured in 1997, suffered the same mechanical problem on both days. But firefighters at the airport said in a radio transmission that it was the same mechanical issue both days. Flight 844 to New Windsor, N.Y., departed the airport at 7:27 a.m. Thursday, the company said in statement. At 7:58 a.m., the crew discovered an unspecified mechanical problem and decided to return to the airport, according to the airline. About 8:30 a.m., the flight tracking website FlightAware showed the plane circling over the Gulf of Mexico. More than a dozen emergency vehicles were in position at the north end of the runway awaiting the plane's arrival. The plane appeared to land without any problems and two vehicles sped toward it as it moved toward the south end of the runway. The plane turned and taxied under its own power to the airport terminal. Shortly afterward, ambulances and fire trucks left the scene. The plane landed shortly before 9 a.m. It was carrying 165 passengers and six crew members, according to Allegiant. The same plane arriving from Moline, Ill., made the emergency landing on Wednesday at 12:19 p.m. at St. Pete-Clearwater, its scheduled destination. The airline also did not identify the mechanical issue on that flight. Within half an hour after landing, passengers on the Thursday were sent directly to another plane for boarding, a Pinellas County Sheriff's deputy told news crews at the scene. Annamaria Accetta of Tampa had family aboard and learned of the problem while scrolling through Facebook during a break at work. She couldn't reach Allegiant so she drove to the airport. When the plane landed, Accetta talked to her 11-year-old son and 70-year-old mother on the phone for about five minutes. She told Allegiant representatives there she wanted to see her son, Tommas, who was crying hysterically, she said. But the airline didn't permit her to see him before he boarded the other plane, she said. "I think I'm about to have a heart attack," Accetta said at the airport. "I'm still shaking." Her friend, Melinda Kebreau, went with Accetta to the airport Thursday. "She has every right and every other customer had every right to be very nervous about their loved ones on the plane," Kebreau of Tampa said. "To let her not even see her 11-year-old who is frantic back there somewhere crying. He just wants his mother." In a statement released about 9:15 a.m., Allegiant said, "The safety of our passengers and crew is our highest priority, and our primary focus is accommodating any immediate needs they may have. Our mechanics will do a thorough investigation of the aircraft to diagnosis and repair the issue." Allegiant is under review by the Federal Aviation Administration after a series of issues in the last year with maintenance and safety. Another Allegiant flight made an emergency landing at the local airport on Wednesday, according to a NewsChannel 8 report. In 2015, airport records show, Allegiant carried about 95 percent of St. Pete-Clearwater's 1.6 million passengers. 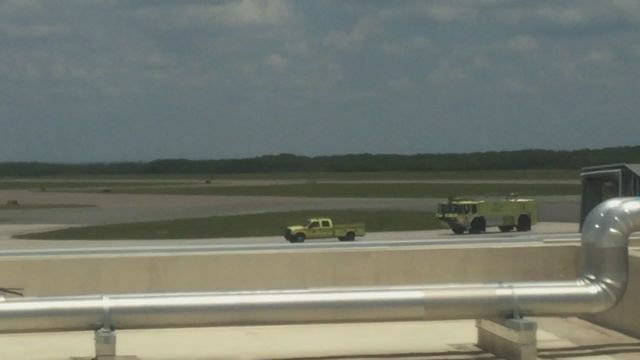 An Allegiant Air flight from St. Pete-Clearwater International Airport lands safely, with emergency personnel close by, after turning around after experiencing a mechanical issue shortly after takeoff on Thursday. Flight 844 to Stewart International Airport departed the airport at 7:27 a.m., the company said in statement. 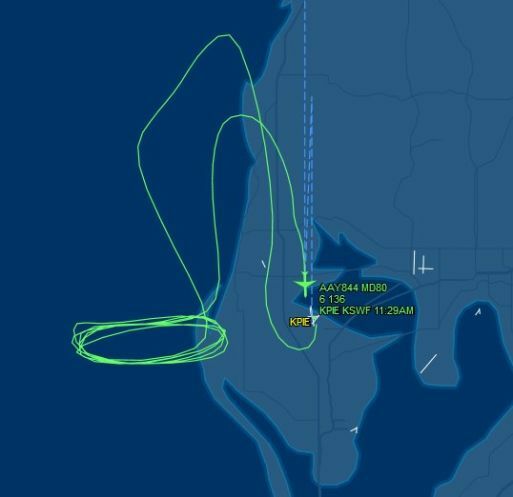 The flight tracking website FlightAware showed the plane circling over the Gulf of Mexico and then returning for an emergency landing. 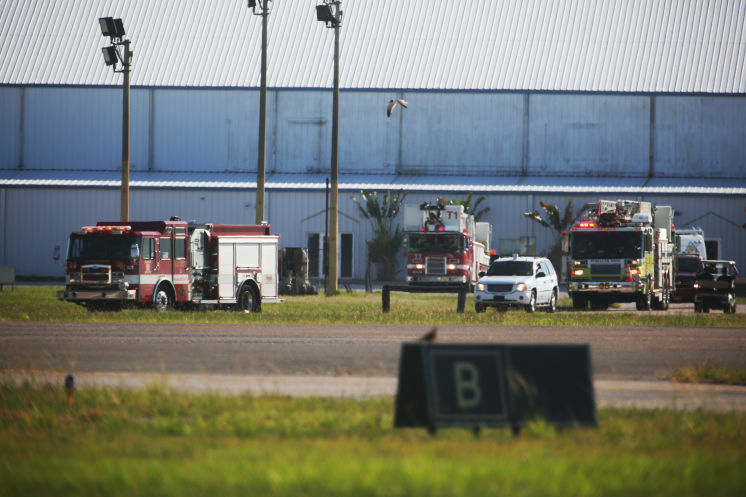 STEWART AIRPORT - Passengers arriving on the continuation of Allegiant Air Flight 844 Thursday told a harrowing tale of circling the St. Petersburg-Clearwater Airport in Florida for about 90 minutes while the crew burned off fuel to prepare for an emergency landing. Lisa Cozzolino of New Paltz, who was traveling with her sister, Carrie Wilson of Center Valley, Pa., said they were about 30 minutes into the flight when the pilot came on the PA system and told them the plane was experiencing a hydraulic problem and they would have to get the fuel level down to what he called an acceptable level before they could bring the plane down. "I was nervous the whole time," Cozzolino said. "I was taking tranquilizers." Wilson said they could see fire trucks on the ground below as they finally returned to St. Petersburg-Clearwater. "I said 'that's not good,' " Wilson said. Derrick Pierce, a former Middletown resident who was returning to visit family, was on the plane with his 2-year-old son, Dalton. He managed to keep Dalton calm as the plane kept circling over land and water. Finally, Pierce said, the plane landed. "I was so happy to be back on the ground." he said. The plane had taken off about 7:30 a.m. It was back on the ground shortly after 9 a.m. The 165 passengers got on a different plane about an hour and a half later and they landed at Stewart International Airport about 1:15 p.m.
A crowd of worried relatives and friends was waiting. "I was so nervous," said Cynthia Zeno of Montgomery, who was waiting anxiously for a group of relatives to arrive on the plane. "I was scared," said Haddy Sanchez, Zeno's sister-in-law, who was on the plane. "I was dizzy the whole time." 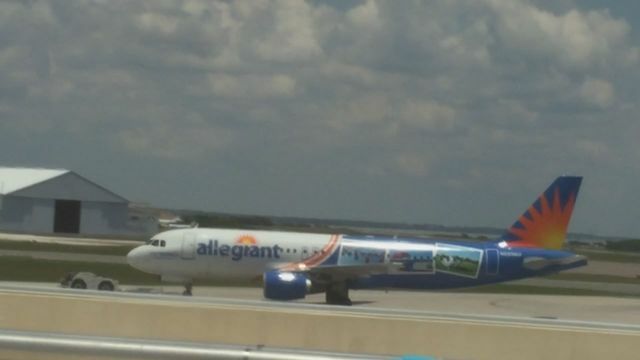 ST. PETERSBURG (FOX 13) - Passengers on an Allegiant Airlines flight from Moline, Illinois to St. Pete-Clearwater airport did not expect their plane would be emergency-landed on Wednesday - but it was. Flight 871 was towed into the gate after making an emergency landing around 12:30 p.m.
Around 140 people were onboard when the plane had a mechanical issue. Allegiant spokeswoman Jessica Wheeler told FOX 13 News St. Pete-Clearwater was already the nearest airport when pilots had to land the plane. Airport crews took extra precautions - including dispatching local fire engines to the runway - as an extra precaution for the emergency landing. "Our mechanics are doing a full investigation and inspection to diagnose and repair the issue," Allegiant Airlines said in a statement. The airline has had a series of mechanical issues and emergency landings in the past year. 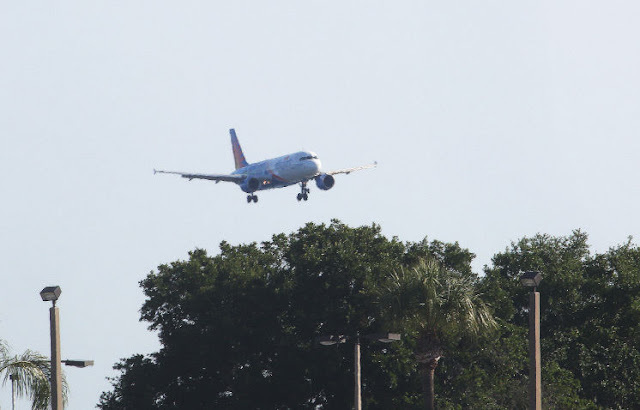 WESH-TV reports a Monday flight from Orlando to North Carolina was forced to turn back to the airport because of a number of issues, including electrical problems. The FAA started a review of the airline in April – two years ahead of schedule – because of the ongoing flight issues. The report could be released as early as next month. The problems used some delays while crews found another plane for an outbound flight. Flight 890, a St. Petersburg to Fort Wayne, Indiana flight scheduled to depart before 2 pm was delayed by several hours. Flight 891, a Fort Wayne to St. Petersburg flight scheduled to arrive tonight will also be delayed. PINELLAS COUNTY, Fla. (WFLA) – An Allegiant Air plane arriving at St. Pete-Clearwater International Airport made an emergency landing Wednesday. Flight 871 traveled from Moline, IL to Pinellas County. It landed at 12:19 p.m., an Allegiant spokesperson said. The spokesperson said the emergency landing was made because of a mechanical issue. Allegiant is investigating and inspecting the plane to repair the problem, officials said. An Allegiant Air flight made an emergency landing at St. Pete-Clearwater International Airport Wednesday after suffering a mechanical problem, according to WFLA-Ch. 8. 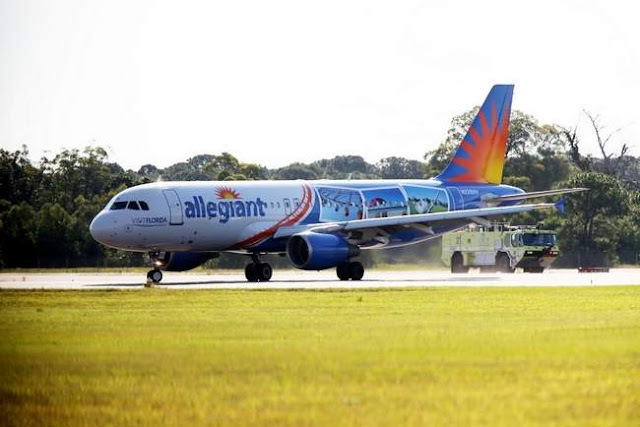 An Allegiant spokesperson confirmed for the station that Flight 871 from Moline, Ill., made the emergency landing at the Pinellas County airport, its scheduled destination, at 12:19 p.m. The airline apparently did not identify the nature of the mechanical issue that caused the emergency nor say how many passengers and crew were aboard. The airline told WFLA that the plane landed safety and that it is investigating the mechanical problem. Allegiant officials did not respond to requests for comment. The Las Vegas headquartered airline has encountered a series of emergency landings and other maintenance issues during the last year and has been accused by its pilots' union of skimping on safety. The airline denies doing so and says Allegiant is one of the safest airlines in the nation. The airline carries about 95 percent of the passenger traffic at the St. Pete-Clearwater airport, which reported a record 1.6 million passengers in 2015. On June 1, 2016, about 0900 eastern daylight time, an Aeronca 7AC, N83547, was substantially damaged after impacting an aircraft hangar following a total loss of engine power during a go-around at New Garden Airport (N57), Toughkenamon, Pennsylvania. 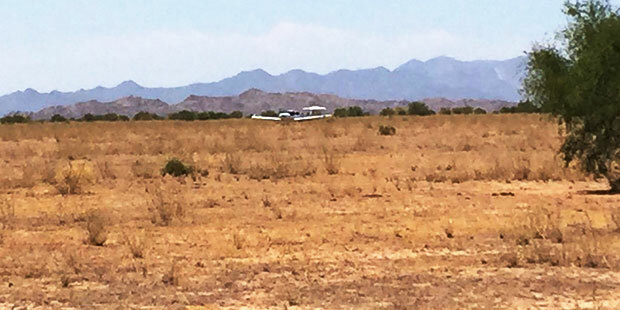 The flight instructor and a student pilot received minor injuries. Visual meteorological conditions prevailed and no flight plan was filed for the local instructional flight operated under the provisions of 14 Code of Federal Regulations Part 91. According to the student pilot, they were practicing takeoffs and landings on the grass parallel to runway 6, for about 1 hour when on the downwind leg of the traffic pattern, the flight instructor directed him to demonstrate a simulated engine failure The student pilot initiated a simulated forced landing which included a steep turn to the base and then final legs of the traffic pattern. The airplane was about one-quarter of the way down the runway, still over the grass, when he initiated go-around. The flight instructor then told him to move over to the center of the paved runway. At this point the engine sputtered and then lost power. The flight instructor took over the flight controls and made a left turn about 100 feet above the ground with the intent of flying over a hanger. The student pilot added that the engine "was now completely off." According to the flight instructor, he and the student pilot were flying for about 30 minutes when he initiated a simulated engine out procedure. 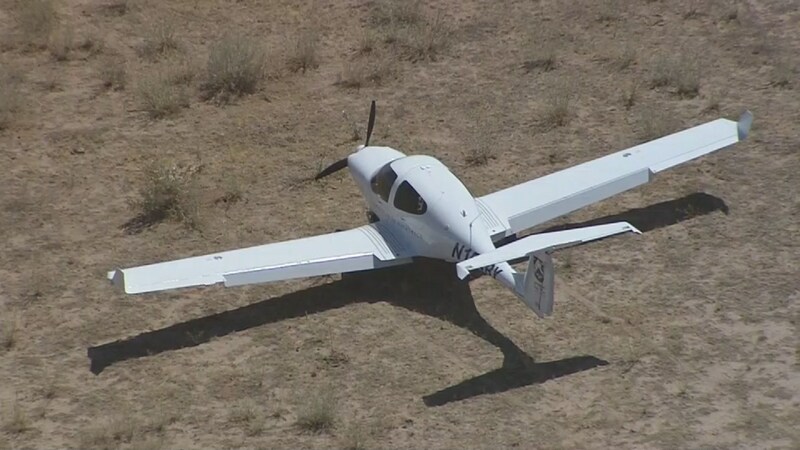 The student pilot maneuvered the airplane for the grass parallel to the runway, and commenced a go-around when the airplane was about 25 feet above the ground. The airplane was approximately 200 feet above the ground when the engine quit, momentarily sputtered, and then went silent. He recalled checking the magnetos, carburetor heat and fuel lever, which all appeared to be in proper position. The flight instructor considered landing options, and noted that a forward trajectory had more dangers and obstacles, such as construction traffic, vehicles, a shallow ravine, electric wires and a busy road. He took the controls from the student pilot and turned left 90 degrees, positioning the airplane in a trajectory over a hangar for a touchdown and rollout on the grass in an uphill direction to dissipate speed and energy. As the turn progressed, the flight instructor realized that they would most likely not clear the top of the hangar and that would be a worse situation. At that point the airplane was losing altitude rapidly and heading toward the hangar door. He used the last movement of the stick control to place the airplane into a 45-degree nose up position to have the engine penetrate the metal door of the hangar before the fuselage. According to a Federal Aviation Administration (FAA) inspector, the airplane came to rest upright inside the hangar after penetrating the hangar wall. The fabric covering of the airplane displayed multiple tears and punctures, the left main landing gear was displaced aft and was collapsed against the bottom of the fuselage, and the right main landing gear was displaced forward and collapsed next to the right side of the fuselage. Both the left and right wing spars were broken and the wings had folded aft just outboard of their mounting locations at the breaks in the spars. The horizontal stabilizers, elevators, vertical stabilizer, and rudder, displayed crush and compression damage. Control continuity was established from the flight control surfaces to the rudder pedals, and control sticks in the cockpit. The front of the propeller spinner was crushed. One propeller blade was bent back under the engine, and the other propeller blade was straight. Neither propeller blade showed any evidence of S-bending, leading edge gouging, or chordwise scratching. The wreckage was retained for further examination. According to FAA and pilot records, the flight instructor held an airline transport pilot certificate with ratings for airplane multiengine land, and rotorcraft-helicopter, with commercial privileges for airplane single-engine land, and instrument helicopter, and a type rating for the BH-206. He also held a flight instructor certificate with ratings for airplane single and multiengine, instrument airplane, and rotorcraft-helicopter. His most recent FAA third-class medical certificate was issued on August 12, 2014. He reported that he had accrued approximately 10,000 total hours of flight experience, 200 hours of which were in the accident airplane make and model. According to FAA and pilot records, the student pilot held a student pilot certificate which was issued on December 15, 2015. He reported that he had accrued 279 total hours of flight experience, 180 of which were in the accident airplane make and model. According to FAA and airplane maintenance records, the airplane was manufactured in 1946. The airplane's most recent annual inspection was completed on March 28, 2015. At the time of the inspection, the airplane had accrued approximately 6,410 total hours of operation. NEW GARDEN >> A 1940s-era airplane crashed after losing altitude at New Garden Flying Field Wednesday morning, colliding with a hangar and injuring two men inside the aircraft. The accident occurred at 8:58 a.m. under ideal flying conditions. 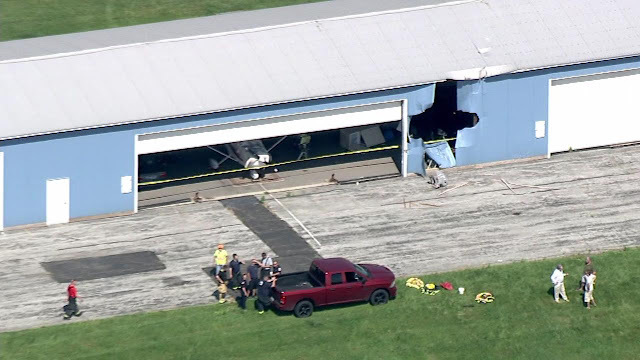 The two men inside the two-seater aircraft, a 68-year-old male and a 70-year-old male, were transported to Christiana Hospital in Stanton, De., according to police. Both are in stable condition with non-life threatening injuries. Their names are not being released until their families are notified. A preliminary investigation revealed that the aircraft, a 1940’s Aeronca Champ left the runway heading in a northeasterly direction when it lost power and attempted to return to the airfield. Upon attempting the turn, the aircraft collided on the east side of a hanger penetrating into the structure where it came to rest. 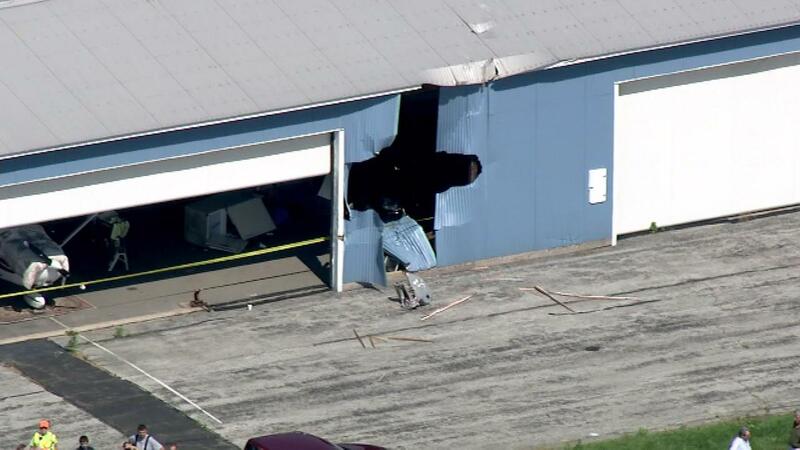 No persons were present inside and minimal property damage occurred to objects within the hanger. The hanger structure has suffered damage and is being evaluated by township engineers. John Martin, manager of New Garden Flying Field, was unavailable for comment. Officials from the Federal Aviation Administration were called to the scene. 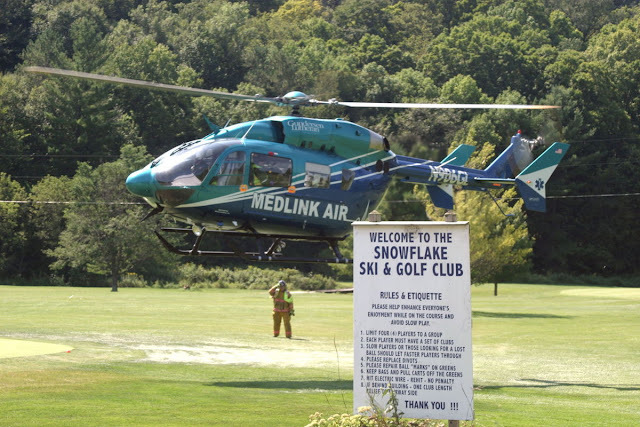 Avondale Fire and Ambulance Company and Medic 94 responded to New Garden Flying Field, located at 1235 Newark Road. Aeronca became the first company to build a commercially successful general aviation aircraft. When production ended in 1951, Aeronca had sold 17,408 aircraft in 55 models. In 1945, following the end of World War II, Aeronca returned to civilian production with two new models, the 7AC Champ and the 11AC Chief. While the Champ shared its tandem seating arrangement with the prewar tandem trainer—and the Chief shared its name and seating arrangement with the prewar Chief designs—both were new designs, and very similar to each other. 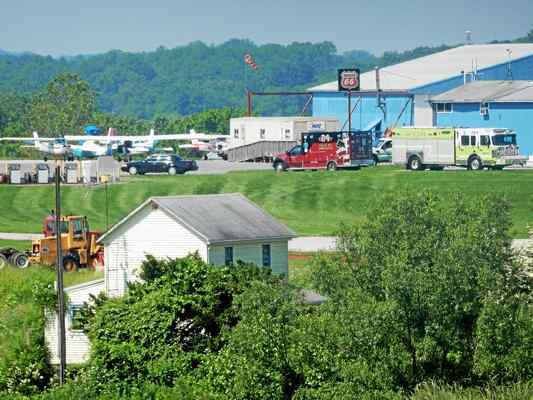 Two senior citizens suffered minor injuries Wednesday morning when a small vintage plane crashed at a Chester County airport. The two-seater 1940s Aeronca Champ plane left the runway at the New Garden Airport in New Garden Township just before 9 a.m., and then lost altitude and crashed moments later, according to a news release from New Garden Police. 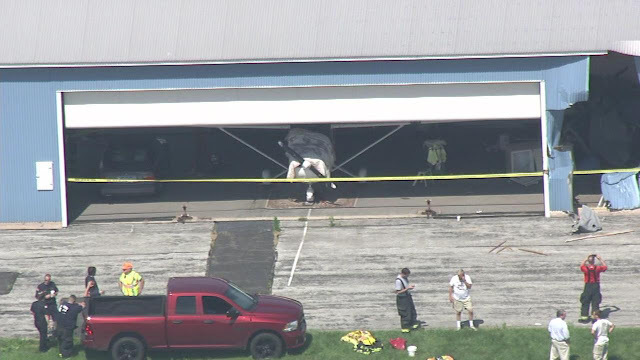 Police and medics responded to the scene, where SkyForce10 captured images of a hole through the wall of a hangar where the plane crashed. Authorities said two men inside the plane, ages 68 and 70, sustained minor injuries in the crash and went to a nearby hospital for treatment. 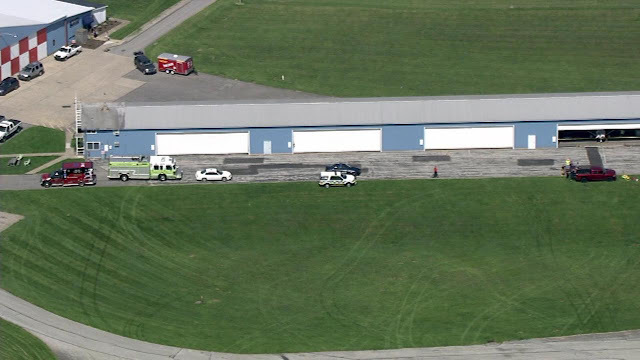 The plane lost power after takeoff and was trying to return to the airfield when it collided with the hangar, crashing clear through the wall. Authorities said there was minimal damage inside the hangar and that no one was in it at the time of the crash. 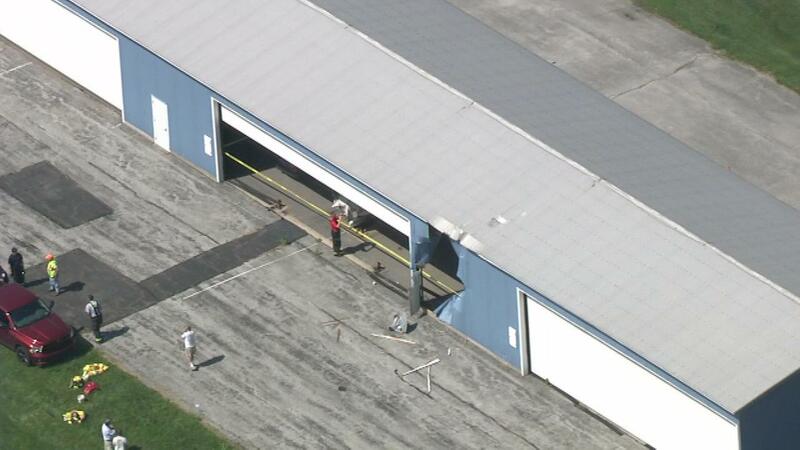 The hangar itself suffered more severe damage, and engineers are evaluating it for repairs. 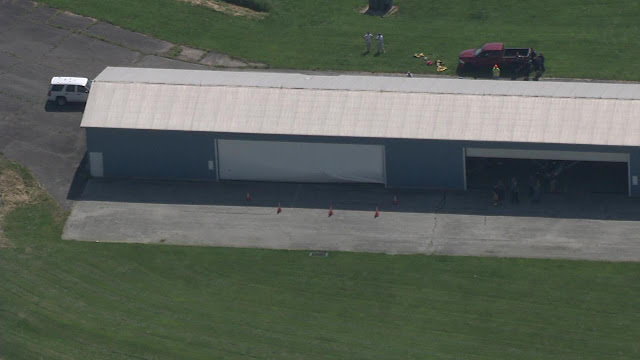 NEW GARDEN TWP., Pa. (WPVI) -- Two people are recovering after a mishap involving a small plane in Chester County. It happened before 9 a.m. Wednesday at the New Garden Airport on Newark Road in New Garden Township. 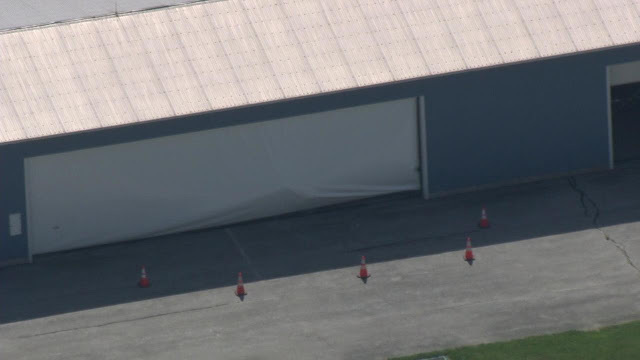 New Garden Police tell Action News a couple was trying to take off in a 1940s-era Aeronca Champ two-seat aircraft when the plane lost power and struck a hangar. 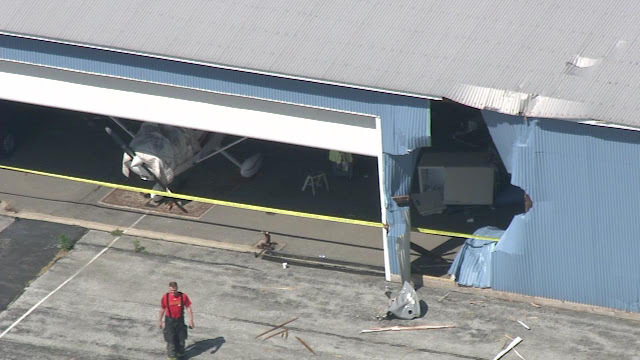 Police say the plane went into the hangar, passing between two other parked planes before coming to rest inside the structure. Neither of the other planes was damaged, and no one inside the hangar was hurt. Video from Chopper 6 HD showed a large, gaping hole in one side of the hangar. The pilot and a passenger were taken to Christiana Hospital to be evaluated for injuries described as minor. Investigators from the Federal Aviation Administration and National Transportation Safety Board are investigating the incident. The sport pilot reported that he had conducted two uneventful touch-and-go landings in the light-sport airplane. After the pilot climbed the airplane to about 200 ft above ground level, the engine lost total power. The pilot tried to turn back to the airport, but the airplane lost altitude and struck some trees about 50 ft short of the runway. The pilot observed fuel "pouring out" of the airplane and shut off the electrical system before exiting the airplane. During a postaccident test run of the engine at several power settings, the engine performed normally with no anomalies noted. The reason for the loss of engine power could not be determined. A total loss of engine power for reasons that could not be determined because the engine ran normally during a postaccident engine test run with no anomalies noted. On May 31, 2016, about 1045 central daylight time, an American Legend Aircraft Company AL3, N156WB, collided with terrain following a total loss of engine power after takeoff from Perdido Winds Airpark (AL08), Elberta, Alabama. The sport pilot incurred minor injuries and the airplane was substantially damaged. Visual meteorological conditions prevailed and no flight plan was filed for the personal flight. The airplane was registered to and operated by MHOC LLC, under the provisions of 14 Code of Federal Regulations Part 91. The pilot was a mechanic for the company that owned the light-sport airplane. He stated that the airplane was due for a condition inspection, and he wanted to "warm the airplane up" before starting the inspection. He arrived at 82J and fueled the airplane with 17 gallons of fuel, waited a period of time, and sampled fuel from the fuel tanks. He completed the preflight inspection and took off for AL08. The pilot made one full stop landing at AL08, taxied back, and departed runway 35 for two touch-and-go landings. After an uneventful touch-and-go landing to runway 35, he made a teardrop turn and planned to land on runway 17. He again performed another uneventful touch and go landing, and while climbing out decided he would return for another full stop landing on runway 35. During his slight right climbing turn, the engine "just quit." The airplane was approximately 200 feet above the ground, and he attempted to continue the turn back to runway 35; however, the airplane subsequently impacted trees about 50 feet short of the runway. The pilot observed fuel "pouring out" and shut off the electrical system prior to exiting the airplane. The engine was then sent to the manufacturer for a full power test-run. The engine was set on an engine run stand and a slave carburetor was installed, since the original carburetor was fractured during impact. The engine started immediately and was idled for several minutes to warm up before the high power runs. The engine was run at several different power settings, from idle to full power, and all parameters were within the manufacturer's specification limits. After approximately 30 minutes of run time, the engine was shut down and no anomalies were noted. On May 31, 2016, about 1045 eastern daylight time, an American Legend Aircraft Company AL3, N156WB, was substantially damaged when it impacted terrain, after it experienced a total loss engine power during the initial climb after takeoff from Perdido Winds Airpark (AL08), Elberta, Alabama. The sport pilot was not injured. Visual meteorological conditions prevailed and no flight plan was filed for the personal flight that originated from Ferguson Airport (82J), Pensacola, Florida. The airplane was registered to and operated by MHOC LLC, under the provisions of 14 Code of Federal Regulations Part 91. The pilot was a mechanic for the company that owned the light-sport airplane. The pilot/mechanic reported that the airplane was due for a condition inspection, and he wanted to "warm the airplane up" before starting the inspection. He arrived at 82J and fueled the airplane with 17 gallons of fuel around 1000. The airplane last flew on May 7, and he waited a period of time before sumping the fuel tanks. He completed the preflight inspection, sumped the fuel tanks, and took off for AL08. The pilot made one full-stop landing at AL08, taxied back and departed runway 35 for two touch-and-go landings. After the last touch-and-go landing, he made a teardrop turn and planned to land on runway 17. During his slight right climbing turn, the engine "just quit." The airplane was approximately 200 feet above the ground, and he attempted to turn back to the airport; however, the airplane subsequently impacted trees about 50 feet short of the runway. The pilot observed fuel "pouring out" and shut off the electrical system prior to exiting the airplane. The airplane, which was equipped with a Continental Motors Inc., O-200-D series, 100-horspower engine, was retained for further examination. Midland-headquartered XCOR Aerospace has laid off several members of its workforce, according to several sources, including XCOR, ahead of the release of a formal announcement. XCOR Chief Operating Officer Randy Baker told the Reporter-Telegram in an email Tuesday, “I can confirm that a number of XCOR employees were laid off last Friday from both the Mojave location and the Midland location.” Baker said the company would not disclose the number of employees nor the positions that were eliminated. Space industry blog Parabolic Arc, which broke the story Sunday, reported that about 25 employees were laid off. The Reporter-Telegram reported in January that XCOR had 63 employees. Parabolic Arc also reported that most layoffs were to its Lynx suborbital space plane team. The Lynx is a reusable horizontal-takeoff spacecraft under development. XCOR’s intent was to launch the Lynx from Midland International Air & Space Port, which received its FAA spaceport license in September 2014. “This innovative propulsion technology has applications to upper stage liquid hydrogen capabilities and further underscores the partnership between XCOR and ULA, USA’s premier launch services provider that was announced March 9 this year,” he said. “XCOR’s current focus on engine technologies was based on an assessment of the best use of resources for both the short-term and the longer-term objectives of the company,” he said. XCOR splits development operations between Midland and Mojave, California. XCOR agreed to move its headquarters from Mojave to Midland in 2012 after agreeing to a $10 million incentive deal with Midland Development Corp., an economic development organization funded by the type 4A quarter-cent sales tax. MDC agreed to pay $2 million in relocation costs, $3 million for costs and expenses associated with its property and $5 million for meeting its payroll requirements, according to the original agreement. 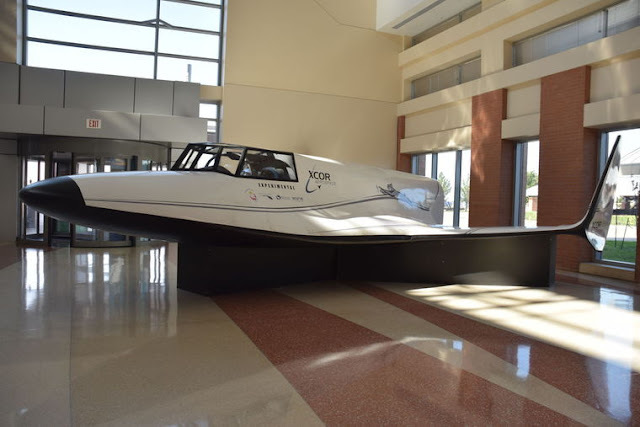 MDC board Chairman Brent Hilliard told the Reporter-Telegram on Tuesday via email that the organization has paid out $9 million dollars to XCOR and $270,000 in lease payments to the city of Midland. XCOR is headquartered at Hangar A at Midland International. The space company and MDC changed their development agreement earlier this year after XCOR indicated that it didn’t need the entire space it was leasing. The unused portion of Hangar A is available for other interested entities to lease. “The restructuring of the hangar requirements followed an assessment of our needs going forward and allowed the people of Midland an opportunity to see even greater reward for their investment by providing facilities that can be leased to third parties to the benefit of Midland,” Baker said. As part of the incentive deal, XCOR is obligated to create jobs at its property at Midland International and pay annual salaries and wages of at least $12 million within six years of relocating to Midland. Baker said the company has no plans to leave Midland. Hilliard said MDC does not think XCOR’s actions will affect the company’s spaceport application. “The commercial space launch license as granted by the FAA stays in affect and can be adapted to other vehicles as appropriate,” he said. AIRCRAFT LANDED GEAR UP, FLINT, MICHIGAN. FLINT (WJRT) - (05/31/16) - A student pilot got some real life training in making an emergency landing Tuesday evening and luckily everyone is OK. 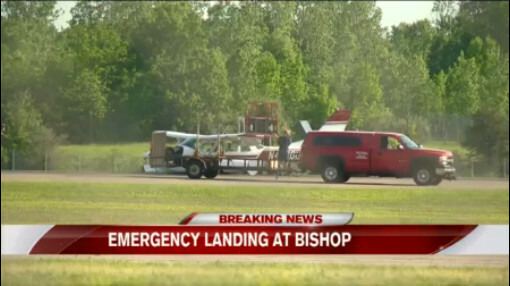 It happened at Flint's Bishop International Airport shortly after 5:30 p.m. According to an airport spokesperson, two people from Alma were on board when they realized they were having an issue. While trying to get to the ground safely, the landing gear malfunctioned too causing the wheels to collapse. As a result, the plane came in on its belly. The runway was shutdown, but we're told it didn't impact any other flights. FAA records online show the plane is a 6-seat Cessna 210E, registered to an owner in St. Johns. AIRCRAFT ON LANDING, NOSE GEAR COLLAPSED, SARASOTA, FLORIDA. The pilot of the tailwheel equipped airplane reported that during the landing roll in crosswind conditions the airplane veered off the runway to the left. The pilot further reported that in order to avoid hitting a drainage ditch he "braked too hard" and subsequently the airplane nosed over. The pilot's failure to maintain directional control during the landing roll, which resulted in a runway excursion, and a nose over. 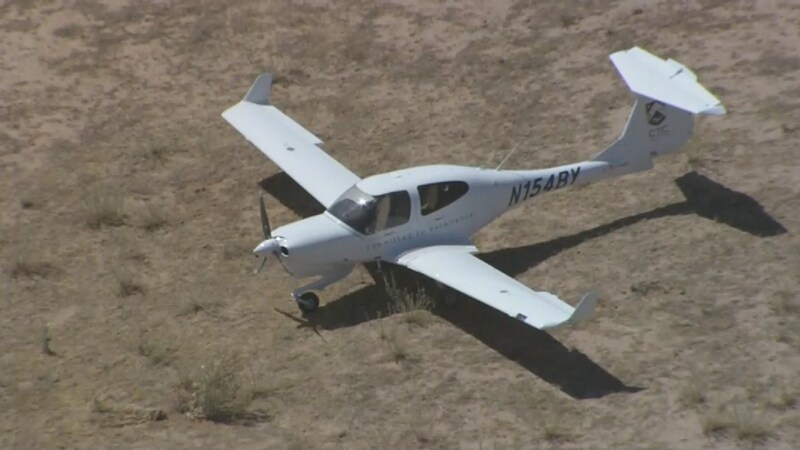 On April 20, 2017, at 0719 mountain standard time, a single-engine Diamond Aircraft DA 40 NG airplane, N154BY, lost engine power during the takeoff from the Phoenix Goodyear Airport (GYR), Goodyear, Arizona. CTC Aviation Training (US) operated the airplane under the provisions of 14 Code of Federal Regulations Part 91 as an instructional flight. The student pilot, the sole occupant, was not injured. The airplane sustained substantial damage. Visual meteorological conditions prevailed for the local area solo flight and no flight plan had been filed. According to the student pilot, he performed a preflight check in accordance with the airplane flight manual; it included a check of the ECU, with no discrepancies noted. Taxi and takeoff were normal until about 400 feet above ground level (agl). The pilot noticed a change in the engine sound. When he looked at the engine load indicator, it read 35%, he then tried to cycle the power level to see if he had any control, but the load indication remained at 35%. Shortly thereafter, the pilot reported the annunciator lights for the ECU illuminate; ECU A FAIL and ECU B FAIL. The pilot stated that he did not believe there was sufficient altitude to turn back to the airport. Per the flight schools standard operating procedures (SOP), below 1,000 feet it is advised to not turn back to the airport. 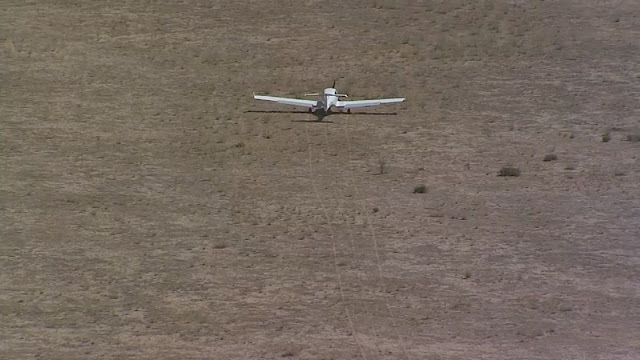 The student pilot maneuvered to a field to the right of him, however, he stated that his altitude was low, and he did not think the airplane was going to be able to clear power lines. He decided to go under the power lines, and as the airplane went under the power lines, it struck the bottom wire. There was a white flash in the cockpit, and the pilot stated that he tried to get the airplane to a field for landing. When the airplane touched down, it bounced, and then eventually struck a ditch. He switched off the fuel pumps, opened the canopy, and exited the airplane. Two Federal Aviation Administration (FAA) inspectors responded to the accident site. A pilot walked away from the crash landing of a small plane this morning in Goodyear. 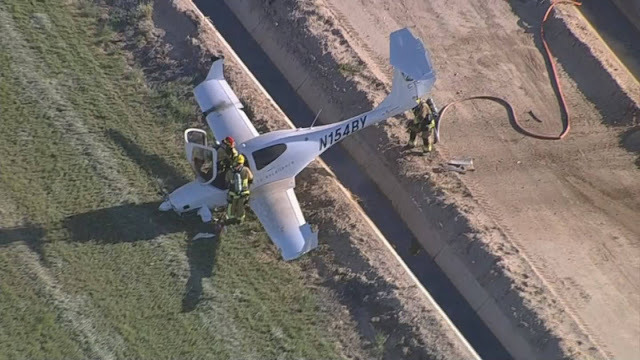 The single-engine prop plane out of Phoenix Goodyear Airport made what authorities described as a “hard crash landing” at 7:30 a.m. about 200 feet south of MC85 between Sarival Avenue and Cotton Lane. The pilot, who was the only occupant of the plane, walked away from the crash and refused medical treatment, according to Tom Cole, deputy chief of the Goodyear Fire Department. Cole said there was no fire at the crash site, but the fire department handled a small fuel leak. 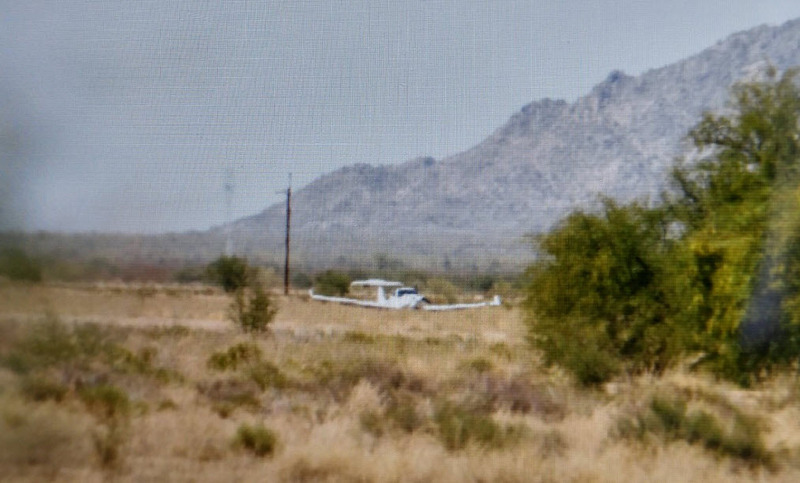 He said Arizona Public Service Co. was also on the scene since the plane may have clipped power lines east of the landing site. The plane did not flip, but ended on its wheels with its nose down into the turf of a farm field, Cole said. 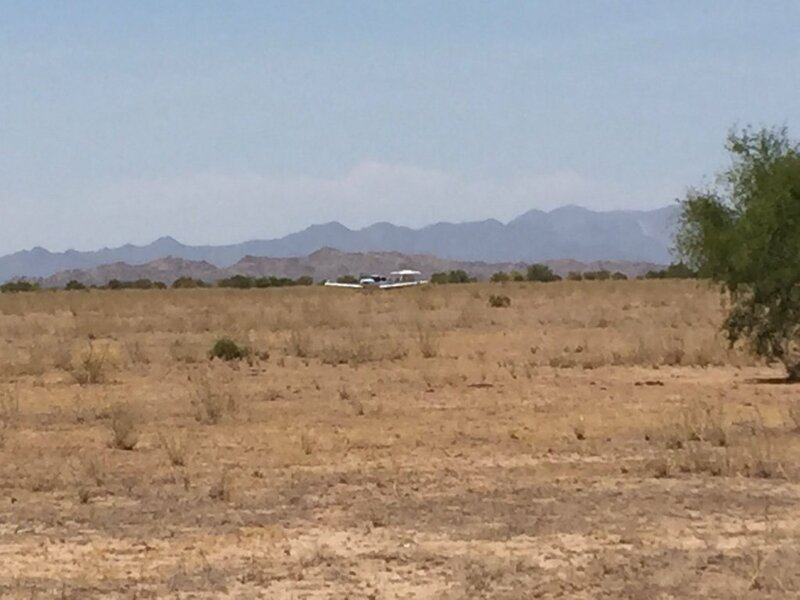 Cole indicated the pilot, who was not immediately identified, was a student on a training flight from an aviation school at the Goodyear airport. As the investigation into the crash proceeds, the plane will be repositioned and towed from the field, Cole said. Cole said the Federal Aviation Administration and the National Transportation Safety Board would investigate the accident. 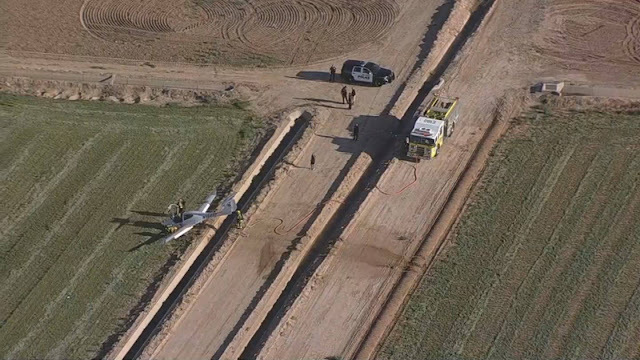 GOODYEAR, AZ (3TV/CBS 5) - A small plane went down in a field in the area of MC85 and Sarival Avenue in Goodyear, not far from Goodyear Airport, Thursday morning. The pilot, the only person aboard, was not injured. The plane had just taken off from Phoenix Goodyear Airport when something went wrong. 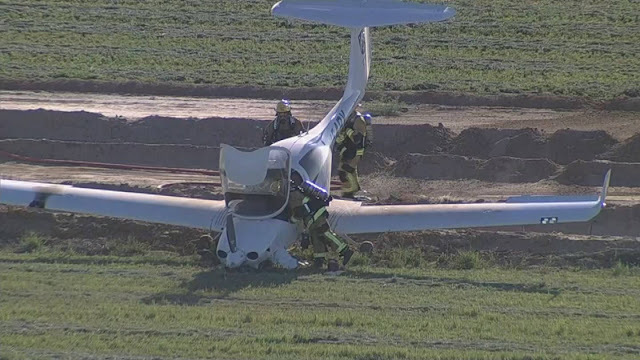 The pilot was able to put the plane down in a nearby field and walk away unhurt. The Goodyear Fire Department tweeted that he refused medical treatment. 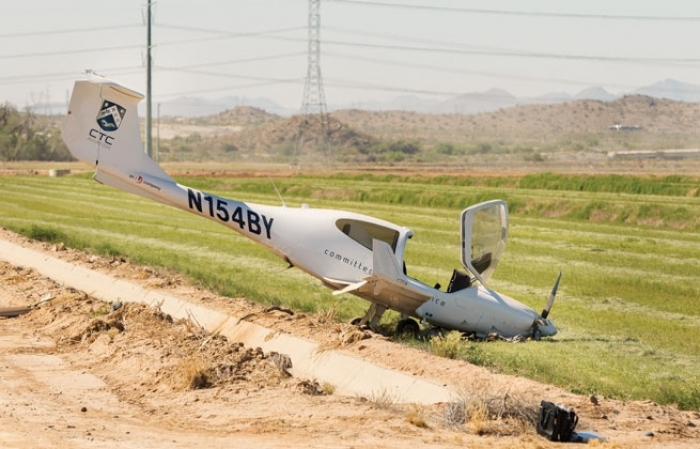 "A single-engine Diamond DA 40 crashed under unknown circumstances shortly after departing from Runway 21 at Goodyear," Federal Aviation Administration spokesman Ian Gregor said in an email response to our inquiry. The Goodyear Fire Department also tweeted that fuel was leaking from the downed plane, but said there was no fire. It's possible that the plane clipped a power line as it went down, knocking out power to a few area residents. Bruce Haffner was over the scene in the Penguin Air & Plumbing New Chopper. His video showed firefighters walking around the plane, which is registered to a flight school called CTC Aviation. The FAA is en route to investigate the incident. The Diamond DA40 is a four-seat aircraft with fixed tricycle landing gear and a T-tail. According to a 2011 analysis by Aviation Consumer magazine, the Diamond DA40 has the lowest fatal accident rate in U.S. general aviation. "Its overall and fatal accident rates are one-eighth that of the general aviation fleet ...," according to Wikipedia. Phoenix Goodyear Airport is a general aviation reliever airport for Sky Harbor International Airport. According to its website, GYR has "one of the best general aviation runways in the country." The U.S. Navy built and ran the airport until 1968, when the City of Phoenix bought it and took over operations. 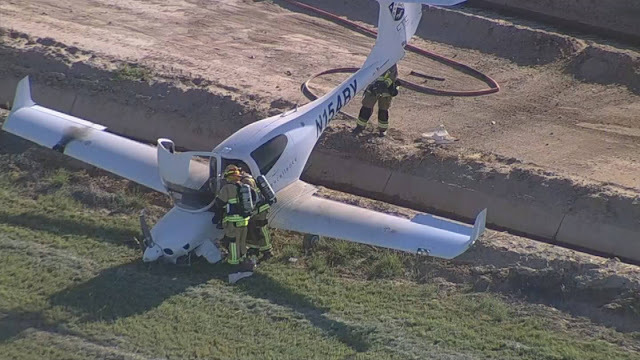 GOODYEAR, AZ - Authorities are responding after a plane landed in an empty lot near the Goodyear airport on Tuesday. 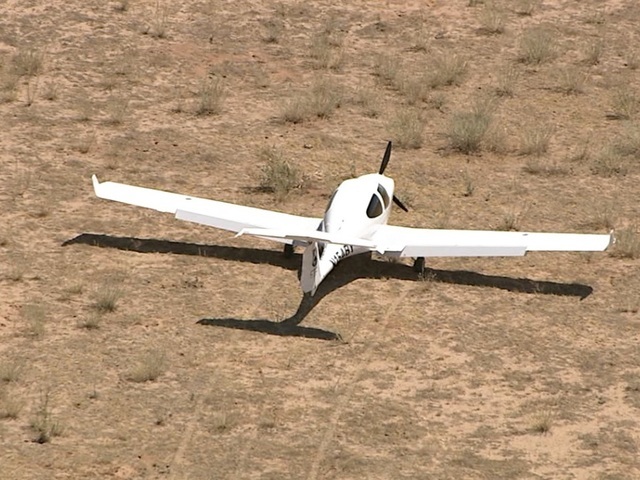 Images from Air15 showed the plane in a desert area southwest of the airport, near S. Sarival Avenue and MC 85. 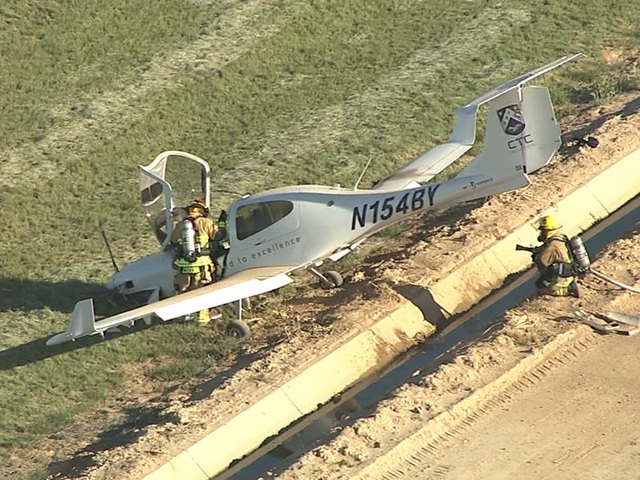 Goodyear firefighters said the plane landed safely and the two pilots onboard were not injured. GOODYEAR, Ariz. — Authorities say a small plane from a flight school had to make an emergency landing in a field south of Phoenix Goodyear Airport. Goodyear Fire Department officials said a crew responded to the scene Tuesday afternoon after reports of a plane down near 163rd Avenue and Ocotillo Road. They said the two pilots aboard the plane weren’t injured. Their names and ages weren’t immediately released, but authorities said the plane was affiliated with BTC flight school. There’s no immediate word on why the aircraft had to make the emergency landing. GOODYEAR, AZ (KPHO/KTVK) - A small plane landed in a field near 163rd Avenue and Ocotillo Road Tuesday afternoon. Crews from the Goodyear Fire Department responded to the scene, calling it out as an Alert 2. Firefighters say the aircraft landed safely just south of an airport.